Hydraulic Dredging - This is a means of harvesting bivalved shellfish from the sand in which they are buried. This technique is employed in Mid-Atlantic and New England waters where bottom conditions will permit it to harvest surf clams and ocean quohogs. The dredge, a large steel construction, is dragged along the bottom by the clam boat. A large pump on the boat pumps sea water through a large hose to a manifold on the front of the dredge. The manifold jets the water into the sand, temporarily fluidizing it and allowing the dredge to pass through. 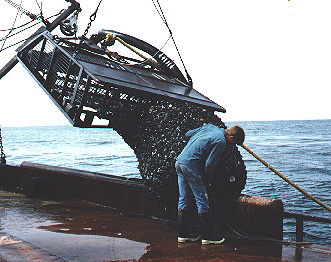 Due to the carefully set spacing of the bars making up the body of the dredge most of the smaller claams and other organisms pass through, the larger clams being retained. While the impact of hydraulic dredges on the bottom at first glance seems severe, the mechanical restrictions that the gear imposes - hose length, pumping pressure, etc. - limits their use to shallow water. The sandy bottom environments in these areas are normally exposed to far greater perturbations during winter storms and take such disturbances in stride. 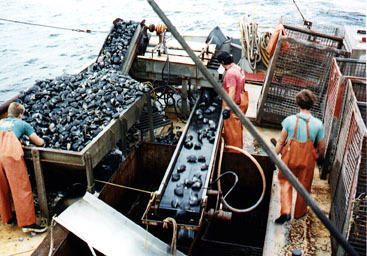 The surf clam/ocean quohog fishery was one of the first in the United States to be managed by individual transferable quotas (ITQs). The right to catch a certain number of clams each year is given to each member of the fishery depending on his prior performance in the fishery. Individuals who own rights to harvest these clams may sell or lease these rights to others. Link to a large image of the hydraulic dredge-equipped clam boat at the dock in Point Pleasant.